Here's the AMOSSHE quarterly bulletin for spring 2016: a roundup of AMOSSHE news, events, and more (click image to view - PDF 2.9 MB). This bulletin contains news about keynote speakers at our forthcoming national conference, Breaking Boundaries. There's also a summary of our recent continuing professional development event about Student Services leadership, as well as infographics showing key details from our latest Student Services benchmarking survey. Student Services leaders in UK higher education have contributed their feedback about a perceived increase in the amount of critical incidents being managed by Student Services – a number of which they believe may have involved suicide or attempted suicide. Members of AMOSSHE, The Student Services Organisation from over 50 UK higher education providers gave their views on the amount of time and resource each incident takes, noting the impact not just on those students directly involved, but also on staff and others who support those affected by these incidents. 80% of contributors believed there was a noticeable increase in complex mental health crises among their student population, comparing 2014 to 2015. 74% of contributors reported working on student incidents that had escalated to involve external authorities (such as the police or coroner) at least twice during 2015. While 26% of contributors worked on such incidents with these authorities only once or not at all during the year, another quarter (25%) had done so six or more times. Overall, 87% had worked with these authorities during 2015. Please note, however, that these incidents might not relate to students’ mental health crises. 53% of contributors were not aware of any deaths by suicide or suspected suicide among their student populations during 2015. Of those contributors who did report that deaths may have been suicide, most (37%) reported only one or two such tragedies. While it would be useful to compare suicide rates among higher education students with rates for the wider population, this data is very difficult to gather. Student Services are not privy to the outcomes of coroner’s reports and police investigations, and if a student dies while away from their institution, universities are unaware of the circumstances unless informed by the next of kin or other third party. As a professional association for Student Services leaders, AMOSSHE enables the sharing of good practice and expertise to help develop student success. Shared feedback such as this helps to give a wider context for our members as they work to support students who face mental health challenges. AMOSSHE provides a forum to share effective intervention strategies, policies and procedures to help ensure that students can achieve their full potential in higher education. AMOSSHE’s latest analysis of UK Student Services provision finds that annual Student Services expenditure budgets have not changed significantly in the last two years, and staff resources have also remained roughly the same. AMOSSHE gathered member feedback during January and February 2016 about student mental health, critical incidents and suicide. The information presented in this member feedback report was not collated as part of a controlled research project, and should not be presented as such. The report is a collation of members’ perceived shared experience of managing complex student cases, some of which involved suicide. The information provided has not been validated, so the findings do not represent any analysis or conclusions. For further information please contact the AMOSSHE National Office on: info@amosshe.org.uk. Here's the AMOSSHE quarterly bulletin for winter 2016: a roundup of AMOSSHE news, events, and more (click image to enlarge - PDF 3.3 MB). This bulletin contains news about booking for our forthcoming national conference, Breaking Boundaries, as well as details about other upcoming events. There are also overviews of the outcomes of our recent continuing professional development work, and details of this year's AMOSSHE Insight research projects. On 4 December 2015 AMOSSHE responded to the UK government Department for Business, Innovation and Skills (BIS) written statement on Disabled Students' Allowances (DSAs). Here’s the government’s written statement: Disabled Students' Allowances: Written statement. AMOSSHE, The Student Services Organisation, welcomes the ministerial statement for informing the sector about the outcome of the consultation on funding proposals for disabled students in higher education. AMOSSHE remains supportive of the overall direction of travel in further developing inclusive practice, maximising independence for disabled students and achieving value for money. We are pleased that our concerns about the timeframe have been addressed, so that the changes will start from the 2016/17 academic year in line with the application cycle. However, there do not appear to have been any other substantial changes as a result of the consultation. Many higher education providers have very good examples of practice in supporting disabled students, as recent HEFCE (Higher Education Funding Council for England) reports have shown, but although significant progress has been made, this is not acknowledged in the statement. AMOSSHE is still concerned that the proposals relating to Non-Medical Help (NMH) provision and procurement represent a significant challenge, and that quality and value for money rather than price and the market should be the primary concerns. We would welcome working further with the Department for Business, Innovation and Skills on this. AMOSSHE would also welcome further clarity and guidance, with case study examples, on where the balance of responsibilities lies with respect to funding adjustments and support for students, and about the quoted areas of exception. Guidance and resources on these areas would be useful for our members to help ensure good practice across higher education providers. Here's the AMOSSHE quarterly bulletin for autumn 2015: a roundup of AMOSSHE news, events, and more (click image to enlarge - PDF 1.9 MB). 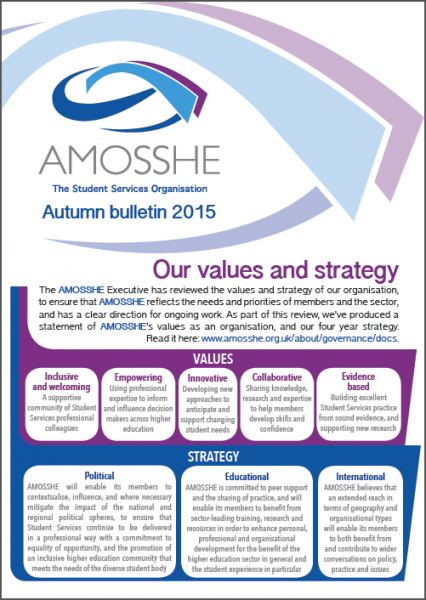 This bulletin contains an introduction to AMOSSHE's strategy for 2015 to 2018, and an overview of the new Executive members elected in July. There's also a summary of our recent research projects and continuing professional development event about tackling sexual harassment and violence on campus, and details of upcoming AMOSSHE conferences. 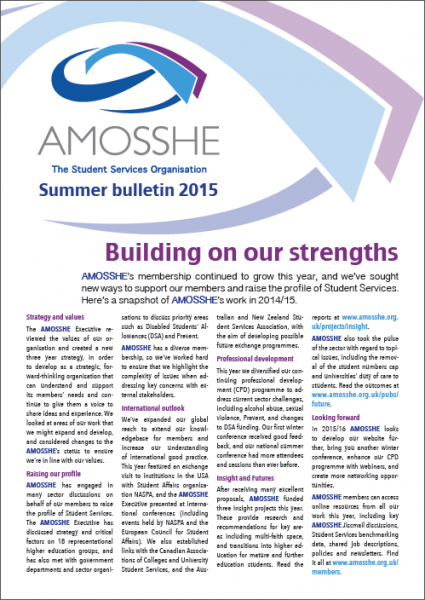 Here's the AMOSSHE quarterly bulletin for summer 2015: a roundup of AMOSSHE news, events, and more (click image to view - PDF 2.1 MB). 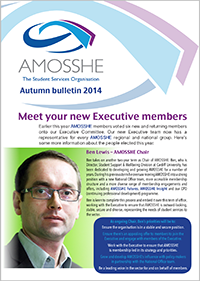 This bulletin contains a roundup of AMOSSHE's work during the 2014/15 academic year, including details of how our Executive Committee has helped influence the higher education sector to give a Student Services perspective. 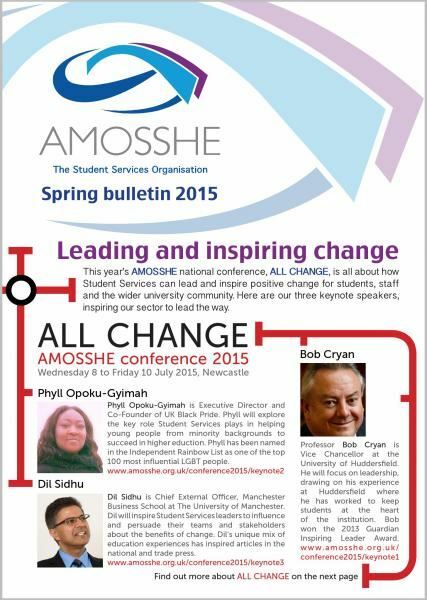 Also, there's a summary of our national conference ALL CHANGE, and details for the AMOSSHE year ahead. In 2015 six roles became available on the AMOSSHE Executive Committee, to serve for a period of two years from 1 September 2015 to 31 August 2017. AMOSSHE members nominated for these roles, and the new Executive Members were decided by a membership ballot. There was no competition for the available Vice Chair (Operations) and Vice Chair (Professional Development) roles, so these appointments didn't require a membership vote. At the 2015 AMOSSHE Annual General Meeting in Newcastle on 8 July, Brian Hipkin (Vice Chair, AMOSSHE) announced the names of the Executive Members who were elected. The new committee members will take up their roles from 1 September 2015. What's the AMOSSHE Executive and why are there elections? Here are the people who join the AMOSSHE Executive Committee for the 2015-17 term of office. Nicole Redman (Assistant Director, Student Services, Anglia Ruskin University) continues as Vice Chair (Operations). Sam Dale (Deputy Academic Registrar, Durham University) continues as Vice Chair (Professional Development). Jayne Aldridge (Deputy Director Student Services, Kingston University). Ben Bailey (Director of Student Services, University of Birmingham). Christine Lowther (Director of Student Services, University of Glasgow). Nic Streatfield (Head of Student Services, York St John University). Congratulations and welcome to all the new Executive Members! Here are the nomination statements from all the new members of the Executive Committee: nomination statements. Many thanks to Maria Lorenzini (Director of Student Experience, Bangor University), who leaves the Executive Committee at the end of August. Maria has contributed a great deal during her year volunteering as an Executive Member, including work on Student Services approaches to sexism, sexual consent and lad culture, and especially taking a lead role in organising the 2015 AMOSSHE national conference. Find out more about the the Executive Member roles. Having been an AMOSSHE member since 2003, I am privileged to have served on the Executive Committee, firstly as an ordinary member and then as Vice Chair (Operations) for the past three years. I am standing again as Vice Chair (Operations) because during this period I believe I have made a considerable contribution to an association I feel passionately about. During this period I have successfully contributed to all aspects of my elected role and taken the lead on several AMOSSHE projects, CPD events and conferences. I have represented AMOSSHE on several national forums and presented nationally, positively promoting our organisation and our members' work to stakeholders across the sector. Throughout all my dealings I maintain a professional approach and remain fully committed to championing the aims and objectives of AMOSSHE and promoting AMOSSHE as the Student Services organisation. Over the past three years I have had the pleasure of managing the National Office and the staff within it. This has seen a time of rapid and significant change to both staff structures and organisational arrangements, which have been dealt with and improved. This includes a relocation of our offices to a more suitable location and, in consultation with the wider Executive Committee, increased and restructured the staffing in the National Office to include a Head of Development and Operations as well as a Membership Engagement and Communications Officer to ensure that AMOSSHE is relevant to and supports the work of our members. I would welcome the opportunity to continue to contribute and serve as part of the Executive Committee for another term. I would be thrilled to continue to work collaboratively with the Chair and wider Executive Committee, ensuring that the hard work already being undertaken by AMOSSHE is taken forward to the highest standards. The past few years have seen significant changes to the sector and structurally to the organisation, and I am keen that these changes are embedded and the team is in a strong position to contribute positively to AMOSSHE strategy. I will continue to ensure these activities are underpinned by our values and with our strategies at the forefront of everything we do in shaping AMOSSHE’s future direction and priorities. This work is also supported by sound, effective and up to date policies and procedures. I am a highly capable manager as well as being financially astute with my background as a qualified accountant. I have extensive experience of leading teams through change, and in my AMOSSHE role this is evidenced this through my work with both with the National Office and the annual conference. I welcome the opportunity to continue in this role, working closely with the National Office team, with whom it is a pleasure to work with and for whom I have the highest respect. There are two main reasons why I am seeking election to the AMOSSHE Executive. Firstly, I would like to continue to make a contribution to the development of AMOSSHE at a time of significant change for the higher education sector both nationally and internationally. As a senior manager working directly in Student Services I am committed to enhancing the experience of students at Durham University. I would welcome the opportunity to channel this commitment into supporting work for the enhancement of the student experience across the sector. My second motivation for seeking election is to build on the contribution I have made to the Executive over the last three years. My major contribution has been to provide a stimulus for creative thinking about the range of services offered and the future direction of the organisation. During my time on the Executive as Vice Chair (Professional Development) I have enjoyed the challenge of reviewing and reinvigorating the way in which the organisation delivers professional development to colleagues. The level of attendance and high levels of satisfaction with the services offered in this area is indicative of having made a difference in this area. If elected as Vice Chair (Professional Development) my priority would be to identify and deliver key topics of professional interest to colleagues in Student Services and to offer these in a range of locations to maximise their reach, acknowledging the geographical spread of the organisation’s members. Additionally, I would seek to broaden development opportunities for Student Services staff by focussing on core leadership and management skills that would help them in their day-to-day work and sessions to aid reflection on career and personal progression. I have extensive higher education management experience, and feedback has shown that I routinely display transformational leadership qualities. I have genuine interest and concern in people as individuals and I value the contributions they make. As a trained and experienced mentor, I routinely use my coaching skills to support colleagues both to achieve and to address issues they currently face. I am approachable and not status-conscious. As a qualified mediator, I have the skills to deal with conflict and difficult situations when they arise. I trust colleagues to take decisions and lead on important matters. I routinely challenge colleagues to question traditional approaches and I encourage new approaches and solutions to problems. I have been an active member of AMOSSHE since 2005 and have just completed a term on the Executive Committee (2013-2015). During this time I have continued to represent AMOSSHE on student funding matters (at BIS and SLC Stakeholder Groups) with particular emphasis on the proposed changes to DSAs including (at a meeting with the Minister of Higher Education and other representatives) successfully negotiating additional time for the sector to put in place necessary changes. I have deployed my experience of working in Million+, 94Group and University Alliance universities to ensure AMOSSHE’s voice has been both heard and listened to in all representative meetings in which I have been involved. I recognise the critical work that AMOSSHE members undertake each and every day in our own institutions and the importance AMOSSHE can have in supporting those activities. If I am given the opportunity to serve another term on the Executive I will continue to listen to the views of members to shape AMOSSHE’s future direction and priorities in order to continue to make our organisation relevant to the day-to-day challenges that we face. I have been an Institutional Lead Member of AMOSSHE for 12 years, and contributed to the Executive Committee for the last four years. In this last term serving AMOSSHE on the Executive, I have made my contribution in a range of areas of AMOSSHE’s work. From leading on our exchange arrangements with NASPA, supporting National Office with the membership survey, to representing us in national forums relating to disability, and co-ordinating a CPD event. Those contributions continue to be motivated by my belief that AMOSSHE is a key part of supporting colleagues in Student Services. Supporting them to deliver important outcomes for students and also therefore, our institutions. Whether about national policy, professional development or sharing and advancing best practice and ideas, AMOSSHE’s work and member networks can be invaluable. The ongoing challenge will include ensuring that we achieve high quality outputs to support members, we make further real advances in understanding of the delivery of excellent Student Services through research, and that our focus is on learning both domestically and internationally. I remain committed to ensuring that as a member-led organisation AMOSSHE continues to consult on and address the needs of members. This is vital in guiding the development of AMOSSHE’s services and to be able to act in a representative way as part of an Executive. I am passionate about seeking to continue to support AMOSSHE’s work as part of the Executive team, and would be grateful for your support in being able to do that. I am Director of Student Services, University of Glasgow, responsible for a wide range of services and the strategic direction of student wellbeing and engagement in the university, and a current Executive Member. Serving on the Executive has been a privilege and I believe that I have made a positive contribution to the work of AMOSSHE. Areas I have made a particular contribution to include playing a lead role in the AMOSSHE Insight projects activity and leading a CPD event on out of hours support, as well as ensuring that a Scottish dimension and the views of Scottish members are included in all AMOSSHE’s activities. If re-eIected, I will continue to promote and develop the AMOSSHE Scotland network, ensuring there are regular meetings covering topics of concern to members, promoting AMOSSHE activities and facilitating discussions with relevant external stakeholders. I will also continue to work to ensure that AMOSSHE is seen as a key organisation to be consulted in relation to government policies affecting students in Scotland, and, working with other sector groups, to develop effective relationships with bodies that impact the student experience, for example the Student Awards Agency for Scotland and Police Scotland. I wish to ensure that members from all parts of the UK are fully involved in AMOSSHE activities: good progress has been made in running CPD events outside London but we need to ensure that events are accessible to even more members, for instance through the development of webinars. It is crucial that the Executive reflects the interests of members across the range of professional staff involved in student support, the range of institutions we work in and all nations and regions of the UK. I therefore hope to receive your support and continue to serve you for a further term on the Executive. I am a psychotherapist by training and have worked in six Universities (five northern and one in London) over the last 15 years. I have also been Operations Director at a software firm specialising in evaluating psychological therapies. Being able to demonstrate the value and impact of the work we do is a key driver of mine. Currently I am Head of Student Services at York St John University. Wellbeing, Disability, Study Development, Student Advice, Student Funding, Induction & Transition, Chaplaincy, Health and the Access Centre all fall under my remit. My role is situated within the Student & Staff Directorate, which has enabled lots of collaborative work on supporting staff supporting students. Partnership working is key and I have led on a number of students as co-creators projects. I have previously been a trustee for the student charity Mental Wealth UK and helped facilitate their integration with Student Minds. I won tweet of the conference in 2014 (surely a career high) and in 2012 presented to conference the results of a JISC-funded project researching the use of self-help material for the digital generation. I am fortunate to have been selected to represent AMOSSHE on the NASPA exchange to Colorado in June 2015, and am looking forward to disseminate my learning from this to colleagues. I am applying to be on the AMOSSHE Executive as I want to be able to contribute to the continuing success of the organisation at a national level. I believe my psychological background and commercial experience will add value to the committee as it continues to champion the vital role of student services in the sector. AMOSSHE is directed by 12 Executive officers, who are Student Services professionals and AMOSSHE members. The Executive, who include AMOSSHE's Chair and Vice Chairs, are elected by the members and volunteer their time to ensure that AMOSSHE works in the best way to support our members, the sector and the student experience. Executive roles last for two academic years, and every year half of the roles become vacant. All named AMOSSHE members have the opportunity to join the Executive by nominating themselves for a role. If there's more than one nominee for a role, AMOSSHE members vote for the nominee they want to elect. Here's the AMOSSHE quarterly bulletin for spring 2015: a roundup of AMOSSHE news, events, and more (click image to view - PDF 1.1 MB). 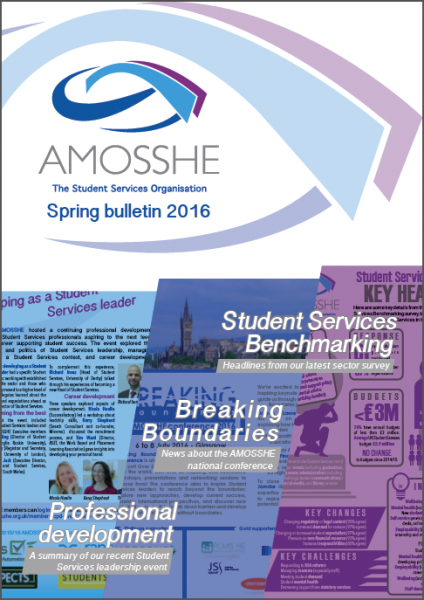 This bulletin contains features about this year's AMOSSHE national conference ALL CHANGE, ten key findings from our 2014/15 Student Services benchmarking survey, and details of AMOSSHE's continuing professional development programme. Here's the AMOSSHE quarterly bulletin for winter 2015: a roundup of AMOSSHE news, events, and more (click image to view - PDF 1.73 MB). 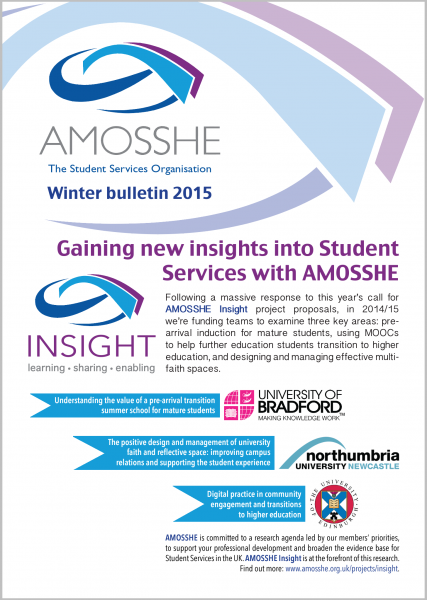 This bulletin contains features about this year's AMOSSHE Insight projects, an overview of our first winter conference, details of AMOSSHE's continuing professional development programme, and news about our summer conference, ALL CHANGE. Here's the AMOSSHE quarterly bulletin for autumn 2014: a roundup of AMOSSHE news, events, and more (click image to view - PDF 2.11 MB). This bulletin contains features about your newly elected AMOSSHE Executive members, an outline of some events and activities AMOSSHE has in store for 2014/15, and details about how your membership feedback has informed our strategy this year.